Dogs don’t naturally walk on leash. Without training, they pull the leash tight even if it means they are choking and your arm is coming out of its socket. Sharp corrections. Take your dog out on leash and every time they pull the leash tight, pull sharply on the leash. It should be a quick snap or yank, not a constant pull. So instead of a constant pull, your dog feels a snap right when they reach then end of the leash. Say “don’t pull” or “walk with me” right as you do that. Stop. Stop every time your dog pulls on the leash. So walk down the side walk, when your dog pulls the leash tight, just stop and wait until they turn around to check on you. At first, you might feel like it’s going to take you 3 hours to get around the block, but a few sessions of this might save you a lot of effort later. Turn. Another twist on the stop method is to change directions every time your dog is about to pull. Just when your dog is about to reach the end of the leash, abruptly change directions, so that they are always having to chase you instead of pulling you. Treats. If your dog is food motivated, try holding treats in your hand in front of your belly button and as long as your dog is walking nicely next to you, give them a treat every couple of minutes. Your dog will soon learn to check in with you often. If your dog is extra stubborn, or you just want to make this easier, here are some collars to try that may help. I would try them in this order. Chest Harness. While it seems like a chest harness would just enable them to pull more, it actually prevents pulling in many dogs, including our very strong chocolate lab. 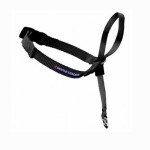 Dog Choke Collar. Make sure you put this one on right. When your dog pulls with a choke collar, it will get a quick reminder not to. When your dog stops pulling, it will immediately get relief. Never leave a choke collar on an unattended dog! Pinc h Collar. While these look mean, they don’t actually hurt the dog and they give you a much easier way to give feedback to your dog. They work like the choke collar, but for dogs that don’t seem to mind being choked while walking, they work a little better. Make sure it fits well and again, never leave a pinch collar on an unattended dog! Distractions. When you know you are passing a distraction, like another dog, walk faster. Faster. 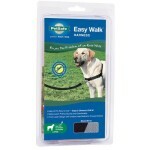 In general, the faster you walk, the easier it will be for your dog to walk nicely. If you run, you’ll notice your dog will probably bounce along beside you and pay attention to you instead of pulling. Change it up. Try walking in different places, with different stimuli and distractions. Have several different adults walk your dog. What have you found works? What questions do you have?